Peonies - Greens. 10 flowers. Home?>?Shop by Product Type ?>? Peonies - Greens. 10 flowers. 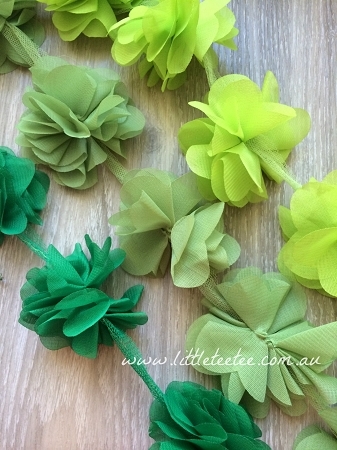 Little Tee Tee's most popular fabric flower are every crafters dream! Not only are they beautifully made with non-fraying edges (although with wear & tear some fraying may appear over time), they are our most versatile piece. Perfect to use singularly or in clusters on clothing, hair accessories, home décor, card making etc. Add a button or a smaller flower in the centre to add your personal touch and extra 'bling'. Colours: as per selection. Singular colour selection means your flowers will arrive in one row. Choose 'mixed' to receive a random selection of 'in-stock' colours shown in this listing. Quantity: You are purchasing 10 flowers (approx 1mtr). Peonies - Yellow & Orange colours. 10 flowers. Peonies - trending colours. 10 small flowers.